Neil Young will release Sugar Mountain Live At Canterbury House 1968 on Nov. 25 via Reprise Records as part of the continuing Neil Young Archive Performance Series. Young played two solo gigs at the The Canterbury House in Ann Arbor, Michigan on Nov. 9 and 10, 1968 and recorded those nights on a TEAC 2 track tape recorder. The tapes of these recordings have never been released but have long loomed large in Young's legend, for they pretty much represent the beginning of the musician's solo career. The 23-track, 13-song Sugar Mountain Live album includes songs written during his Neil Young's tenure with Buffalo Springfield, along with then-new material as well as between-song anecdotes. One of the spoken-word standouts is an amusing tale of Neil's hapless "day job" experience working in a Toronto bookstore that still brings laughs today as it did that night so long ago. 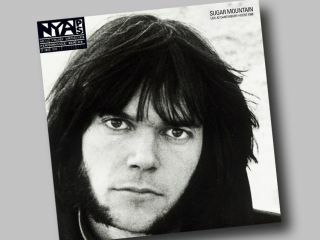 It should be noted that Sugar Mountain Live is not slated for inclusion in the long-anticipated Neil Young Archives Vol. 1 (1963 - 1972). The 10-disc Blu-ray and DVD packages will be released early in 2009 with a specific date forthcoming. The legendary title track, written on Neil's 19th birthday, is certainly a highlight as are such songs as Mr. Soul, Expecting To Fly and The Loner. Just about every one of the thirteen songs included in the album came to be appreciated as touchstones of Neil Young's brilliant songwriting prowess over the decades to follow.